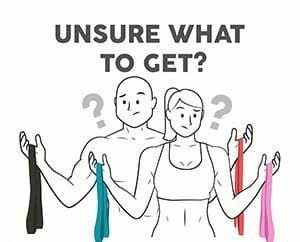 Which Resistance Bands Do I Get? The most common question we get is ‘how to choose to right band or combination of bands for different exercises’. We created a handy selection guide to help inform your decision since resistance training can vary widely from assisted bodyweight training. For example, the pullup band section is based on strength and weight needed to offer assistance. Conversely, the powerlifting band section is centered on the amount of load you want to add to your lift. Fitness nerds [like us] can find our technical stretch force data here. Still wondering ‘which bands is right for me?’ contact us and we’ll get you sorted out.